Veteren poet Shri Natvarlal Pandya ‘Ushnas’ passed away today. He was 91. 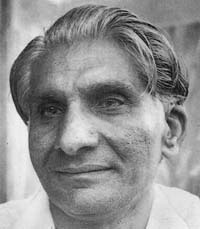 Usahnas, born in Vadodara’s Savli(28-9-1920)town. After having education in Mehsana, Siddhpur, Savli and Dabhoi he passed B.A with Sanskrit in Vadodara’s M.S.university in 1942. In 1945 he passed M.A. with Gujarati as main subject from same university. Later he worked in Rosery high school, Garda college(Navsari), arts college(Valsad). He became Gujarati Adhyapak Sangh’s President in 1979. In 1976 he travelled to Europe, Canada and America. In 1959 he received Kumar chandrak. He received Narmad gold medal in 1971 and Ranjitram gold medal in 1972. He also received Sahitya Academy award in 1976. His first poetry collection published was Prasoon(1955) followed by Nepathye(1956), Aardra(1959), Manomudra(1960), Trun no grah(1964), Spand ane Chhand(1968), Kinkini(1971), Bharat darshan(1974), Ashvatth(1975), Rupana Lay(1976), Vyakul Vaishnav(1977), Pruthvine Paschim Chahere(1979) and Shishulok(1984). Gujarat Chief Minister Narendra Modi remembering ‘Ushnas’ today said in his public meeting in south Gujarat’s Vapi that Ushnas was a son of Valsad district and son of Gujarat. Modi recollected how he used to read poetry of Ushnas when he was in school.